Matt Faustus, whose very soul is connected to a high ranking fiend, finds himself neck-deep in a new case - one he accepted despite being warned about the possible ramifications. A little girl is missing, abducted by the family's house-cleaning demon, and it's his job to find her. Eager to earn that paycheck, Matt's enthusiasm soon lands him in trouble within the Hellspawn society, though that sure doesn't stop him. I received this book in exchange for an honest review. My thanks to R.J. Clark for giving me the opportunity! This came as an unexpected surprise, especially considering I added this one to my Goodreads shelf way back in 2011; the year I made the decision to start reviewing everything I read. Being able to jump into something that piqued my interest that long ago, well, it was more than nice. 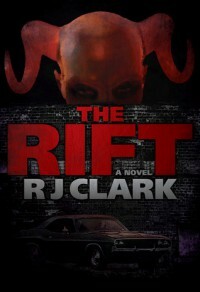 What initially drew me in was the compelling aspect of the Rift itself, and how it expelled demons of all shapes and sizes right out into the city of New Orleans. Can you imagine if that happened? It's a terrifying thought; an apocalyptic occurrence right out from Revelations. However, whilst the book includes adult themes of gore and some sensitive subject matters, I wouldn't classify it as horror. For me, it was urban fantasy through and through - perhaps on the darker side of the spectrum, yes, but urban fantasy all the same - a genre that still appeals to me despite my tastes evolving toward more darker material. Matt was certainly an entertaining and likeable protagonist, even if he displayed selfish and immature behaviour, but those faults didn't affect my impression of him. His soul-bound connection to Baalberith was yet another high point, offering a more intimate and unique peek into the relationship between man and monster. A large part of what intrigued me was Matt's entire history - there's so much backstory, so much unexplored territory to his character. Mentioned throughout were snippets of his difficult childhood, a large portion including Father Donovan and his ceaseless exorcism attempts. Clark has a great amount of freedom if he wishes to return to the world in which Matthew resides, either as a recollection of earlier events, or following the conclusion of this debut. Maybe even involving a new hero entirely! My favourite character had to be Persephone, however. I found him a great addition to the team as he added much needed spice to what would've been a couple's day out. There was nothing wrong with Alura per se; she had a temper I found to be enticing, and I loved the Succubi as a species, but overall I didn't quite feel connected to her partnership with Matt. This could be because their attachment had already been established, and instead of accompanying them along with their courtship, I was thrown into the middle. I felt somewhat lost at times, and when particular information was held back, of which concerned the reason why they had fallen out in the first place, it even further distanced me. The plot itself was the definition of action packed. It just didn't stop; trouble followed Matt everywhere, biting at his heels. I appreciated the fact that injuries were in abundance - pain, bloody and brutal, was dished out over and over. There's nothing more tedious than an overpowered hero that comes out on top of every bad situation. For me to get properly invested and absorbed, there has to be that feeling of danger and struggle, even if it's nothing but a convincing illusion. Clark was able to pull this off superbly, successfully giving considerable weight to every threat. The ending also held a twist I adored, because of the sheer horribleness of it. Suffice it to say, I felt sorry for Matt. As for the Bestiary and wide selection of demons - I enjoyed the large amount of creativity put into their creation. They had their own culture and each offered their own strengths and weaknesses. It might not have been pretty, but I was completely on board with that. As you can tell, I've a lot to say about this once forgotten novel as I thoroughly enjoyed it, but I do believe it's in need of further editing. There's a large amount of mistakes; incorrect words placed within sentences, although it didn't bother me all too much. In conclusion: I would consider this a great beginning to a series. I enjoyed the demonic elements, and Matt as protagonist. This book deserves more recognition in the urban fantasy genre, for sure, however I believe it needs a bit of tidying up in regards to sentence structure. Most humans saw these creatures as second class citizens, and treated them decidedly so. Like their slaves for the most part. Regardless of the concept of inalienable rights, man is a creature attracted to subjugation, and since it wasn't legal in this country to enslave each other anymore, many figured they'd just substitute the Hellspawn. Demons were the food that fed that primal urge without attracting social ire or reproach.